Poetry speaks in a language all its own. Hopefully these pastor appreciation poems will help you show your thankfulness in a language clearly understood by your pastor. Up a narrow and rocky path, A little church was placed. In the dust of that narrow lane Are footprints that time has erased. If the walls could talk to us now, Oh the memories they would bring back, Of the old log pews which were made by hand And the potbelly stove which heat did lack. Their favorite old hymns were sung with love, In their hearts the joy bells were ringing. With the warmth of the Spirit in their smiles, The message of salvation the preacher was bringing. The churches now are so modern With fancy pews and furnaces grand, Even air-conditioners for cooling To sooth the discomforts we can’t stand. The little lane is all but gone now And the church roof is sagging low, But the memories can linger in the hearts Of all who went and loved it so. Can’t you see you’re going too fast? Know that I am here to take care of you. This pastor appreciation poem is about how God uses pastors in our lives. This pastor appreciation poem is based on Ephesians 4:8-13 which reads, "When Jesus ascended to the heights, he led a parade of captives and gave gifts to his people...He is the one who gave these gifts to the church: pastors and teachers. Their responsibility is to equip God's people to do his work and build up the church, the body of Christ..."
He chose to send gifts to those he set free. He could have, of course, chosen to give us anything: Knowledge, spiritual growth, protection from the Evil One, or even comfort during trials. He chose to give us, you. This pastor appreciation poem would work well for a Worship Pastor. As she raises her baton. As the music begins to dawn. Echoes out over the silenced throng. Has left the audience in a quiet daze. For they know the reason, though not said aloud. If the director takes the time to care. Who's love for music, the choir will share. This pastor appreciation poem speaks of the reasons we need pastors but are too uncomfortable to admit. Afraid that our lives will end and few will notice. Surrounded by a crowd we're all alone. There's so much more to life but we can't quite reach it. No matter how hard we try, a meaningful life escapes us. Worried about tomorrow, worried about the past. Our lives are full, but our hearts aren't satisfied. Longing for something to make sense of it all. Someone who accepts us for who we really are. We'd never tell you this, pastor, but we need you more than you know. This pastor appreciation poem is adapted from Psalm 23. We're no longer in want. And he is used by God to restore our souls. We are not afraid because he walks with us. His teaching and correction comfort and strengthen us. He helps us stand strong in the face of evil. He is the oil of healing and health in our souls. Through him God has overflowed our lives with blessing. Because the Lord gave us a shepherd. The following pastor appreciation poems were graciously provided by Hope Christian Reformed Church in Brantford, Ontario, Canada. They are posted here with permission from the church's webmaster, John Gilson. The individual authors are noted at the end of each poem. This pastor appreciation poem was written by the author for her pastor's ordination. The word "pastor" is used as an acronym. Is the gift of our pastor's heart. Serving his father giving Godly advice! Is the gift of a caring pastor's heart. 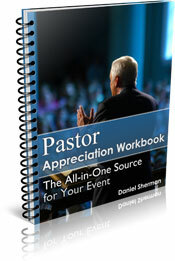 This pastor appreciation poem speaks to the call God places on the life of your pastor.